About a year ago I had the opportunity to take a very quick road trip to Riva del Garda. When I say quick, I mean I was there for not even 24 hours. It is a beautiful escape tucked between Lake Garda and the Italian Alps. When me and my husband arrived it was late in the day so we found a nice restaurant with seating outside within view of Lake Garda for mussels and aperitivo (an Italian custom of drinks accompanied by crackers, olives, meats). It was romantic and felt like I was thrown into a movie, except this is real life so it’s much better. The next day I only had the morning to wander around on my own and since this is Italy of course not many things were open. I took the opportunity to just relax, slowly wander the streets, and take pictures of beautiful things. If you are new here, photographing Italian towns before everyone wakes up is definitely one of my favorite things to do. Because I truly believe that places are not just beautiful backdrops for us to visit, although they have the potential for this, they are real places with real people. I think that as a travel writer I should provide more context and be more accountable so I had a difficult time writing this article -but- I am human. I just went here for a few hours, barely anything was open, and only just a few people were around. There is not much written about Riva del Garda. This prompted me to at least introduce this small town in hopes others might want to go and explore more. Riva del Garda is a small town wedged between the northern-most edge of Lake Garda (Lago di Garda) and the southern edge of the Italian Alps. It is part of a region of Italy called Trentino which is actually an autonomous province. This means that it governs itself similarly to Sicily or Sardinia, or Wales in the UK. It is part of the country but has more power than other places to govern itself. With a strategic position at the northern tip of Lake Garda, Riva del Garda, has had a complex history (what European town doesn’t?). It is thought that its first settlement here was the Etruscans. It was once under the rule of the Venetians and then under the rule of the Austrian Habsburgs and did not become part of Italy until the end of WW1. Riva del Garda feels like many Italian towns, but with a medieval touch, and has a shockingly mild Mediterranean climate. You can see palm, olive, and lemon trees all around in spite of the alps being within view. If you are interested in adventure sports, this region is well known for kite surfing, rock climbing, sailing, canyoning, paddle boarding, etc. Clearly I am not well-versed in these types of things but I thought I’d pass on the info for the curious. There is a lot to see around Lake Garda but with less than 24 hours here I’m definitely not an authority or attempting to be one. I just wanted to share a beautiful town with hope that it might inspire you. 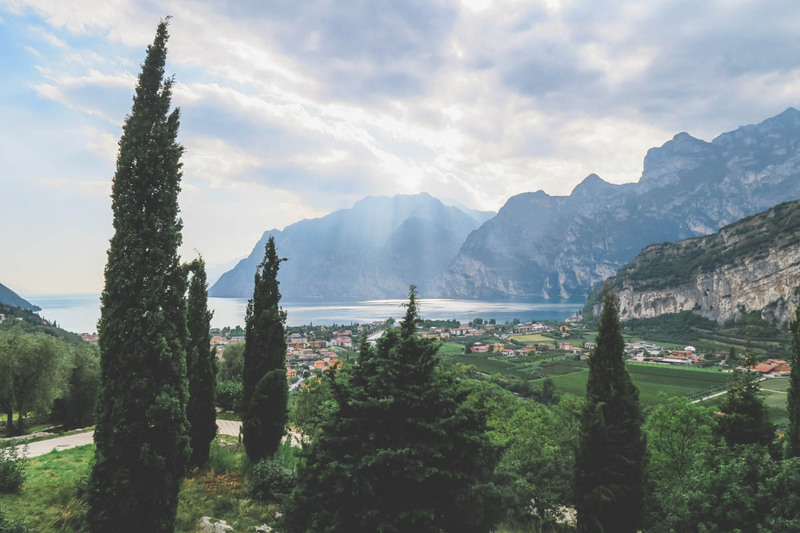 It is a given that if you go to Riva del Garda you will see Lake Garda, just make sure you don’t forget to take some time to take in the beauty of the largest lake in Italy. This medieval tower was first mentioned in 1273 and was originally lower than its current 34 meters. Designed as a viewpoint to protect the town, it now offers panoramic views. Rocca dates back to 1100s and was once a castle that through time was transformed and repurposed by many people and governments and today holds the Museo Alto Garda (MAG). The museum has a picture gallery, archaeology section, local history, and temporary exhibits. If you go into the museum, you can go up in the highest tower of it to get a unique viewpoint of Riva del Garda. By Car: It takes about 4.5 hours from Ljubljana (2 hours from Venice, ~3 hours from Milan) I can’t turn down a nice road trip but if you are wandering around Italy without a car there are other options. By Ferry: If you are in the south of Lake Garda you can take a ferry from Desenzano del Garda via Peschiera del Garda, Salò, Garda and Malcesine which takes about 2 hours. By Train: If you are traveling by train you can take it to Rovereto and then the bus to Riva del Garda. By Bus: Alternatively there are a lot of bus routes that can take you directly to Riva del Garda from Brescia (easily reached from Milan) and from Verona (easily reached from Venice). Or as they say in Italy ciao e grazie! Thank you so much for taking the time to read this article. I hope that some of it was useful or interesting to read. As I am going through my hard drive I have a lot more Italy-based content coming your way this year. If you have any other suggestions for our readers leave a comment below and don’t be shy to follow me on Twitter and Instagram and say hello! I loved the photos. It is amazing to see the mountains towering over the city. It makes me wonder if there are any structures carved into the side of the mountains. As it was Italy, definitely haha they love building things right into the mountains. I will keep my eyes open when I go back in June.